Last year, the silver price dropped drastically from $18.29 an ounce at the beginning of 2015 to $13.83 to kick start 2016. No doubt, the silver price has been on the rebound this year, rising 42.66 percent back up to $19.62. Here are a few silver price predictions. Last year, the silver price dropped drastically from $18.29 an ounce at the beginning of 2015 to $13.83 to kick start 2016. No doubt, the silver price has been on the rebound this year, rising 42.66 percent back up to $19.62. Plenty of silver price predictions are calling for a correction for the white metal, however. While the silver price is currently hovering just under $20 an ounce, the white metal closed in around $21 an ounce in July post-Brexit and has outperformed its sister metal, gold, by almost double. While the yellow metal has also seen a significant increase this year, by comparison its increase year-to-date is 25.31 percent. 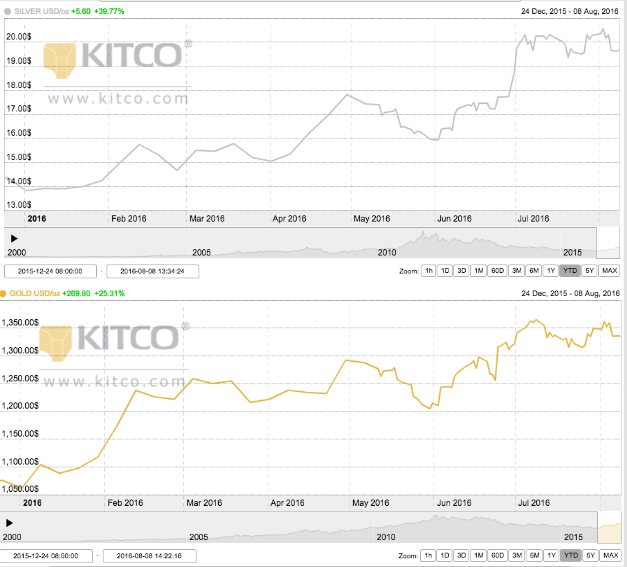 The charts below show comparison between the silver and gold prices so far in 2016, as per Kitco. Moving ahead for the rest of the year, silver price predictions from analysts polled by FocusEconomics in its July 2016 report put prices ending the year at lower levels than what they’re currently at, with a minimum average of $13.4 per ounce and a maximum of $20.5 per ounce. 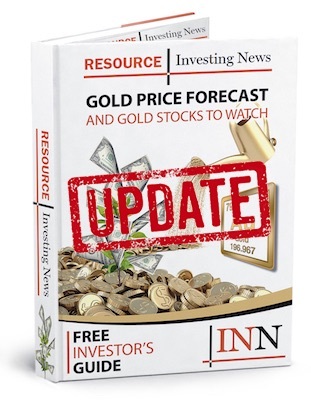 With the silver price rising drastically this year, Investing News Network (INN) looked at what the contributing factors are and a few new silver price predictions. The Fed: The US Federal Reserve announced July 31 that interests rates would remain the same, which kept the silver price rising 3.8 percent for the day. Money Morning Resource Specialist, Peter Krauth, expects the silver prices to climb higher in 2016. In early July, the silver price reached a two-year high as it jumped over $20 an ounce. Demand from Chinese buyers was a contributing force, as reported by the Wall Street Journal. Mining.com also wrote that Asian buyers were quick to dive into physical silver. Of course, it’s difficult to talk about the silver price without talking about demand for the white metal. As Todd Anthony from First Majestic Silver (TSX:FR) said in an interview with INN, silver has underperformed gold over the last four or five years until now, and investment demand is increasing globally. “You’ve got solar panels. You’ve got hospital applications. You’ve got anti-bacterial usages, TVs, cellphones, you name it. There’s always new applications for silver and there’s a lot more to come,” Anthony said in the interview. Peter Krauth, resource specialist at Money Morning, made similar comments, stating that demand for solar power is rapidly growing. “With solar panels containing an average of 15 to 20 grams of silver each, this industry will have a marked impact on demand, which will translate into higher silver prices,” he said in the publication. A Profit Confidential article also suggested that supply is shrinking and demand for the white metal continues growing, and its usage in an assortment of electronic devices will drive demand for the metal higher. Although the silver price has cooled off somewhat due to losses after the US’ job data on August 5, silver is still the best performing precious metal and some analysts are projecting it will continue rallying. Over at Money Morning, Krauth said the silver price could reach $22 an ounce by September. Another analyst over at Profit Confidential said the silver price could hit $50 by 2017 if supply continues going in a downward trend while demand for the white metal rises. No doubt, it’s exciting times for the precious metal, and investors will surely have something to consider when looking into the silver sector. This time last year, silver market watchers were hopefully predicting that the white metal’s price might improve by the end of 2015. The metal was changing hands at about $16 per ounce, and some analysts were predicting that in 2015 it would average over $18. As those who’ve followed the silver market this year are no doubt aware, those predictions were off the mark. As of the end of November, the silver price was down a whopping 11.73 percent year-to-date, changing hands at just $14.19. And according to Thomson Reuters GFMS, as of November 13, the silver price had averaged only $15.91 for the year. Silver price year-to-date as of November 30, 2015. Image courtesy of Kitco. The question now, of course, is “what went wrong?” To answer that question and to find out what’s in store for 2016, the Investing News Network reached out to silver market participants, including Erica Rannestad, senior analyst at Thomson Reuters GFMS. Read on to find out what they had to say. Mine production peak — In 2015, silver mine production is expected to come in at 867.2 million ounces, Rannestad said. That’s only a 0.3-percent increase from the previous year, and the slowest rate of growth since 2002, and her firm doesn’t anticipate improvement in the future. In fact, Thomson Reuters GFMS is predicting a decline going forward — “that’s a big theme that’s relevant for 2015 and 2016,” she stated. Looking more closely at silver supply and demand for 2015, Rannestad said that total silver supply is expected to come to 1,014.4 million ounces this year, down 3 percent from 2014. Factors driving the decline include flat mine production, lower scrap return and net dehedging of 12.6 million ounces. Meanwhile, total physical demand is set to fall 2.5 percent in 2015, hitting 1,057.1 million ounces. As stated, Thomson Reuters GFMS sees the weak Chinese economy as being largely responsible for that fall; however, Rannestad also mentioned the “miniaturization of consumer mobile devices” as a factor. “That’s a trend that’s really reduced the amount of silver needed on the whole per unit,” she said. All in all, Thomson Reuters GFMS is calling for a physical silver deficit of 42.7 million ounces in 2015, and anticipates an average 2015 silver price of $15.51. Explaining further, she noted, “the physical surplus/deficit doesn’t matter year to year unless it’s very, very large.” The predicted 2015 deficit is far from large — at just under 43 million ounces, it’s a drop in the pond compared to the near billion ounces of supply set to enter the market. And while “a chronic deficit in the market can begin to influence prices,” a 2015 deficit would only be the third in a row. In terms of price catalysts that investors should watch, Rannestad again pointed out that China has had a major impact on physical silver demand in 2015, and said market watchers should expect the same next year. She also noted that “anything that affects the gold price, obviously silver takes its cue.” Right now, of course, most gold bugs have their eye on the upcoming US Federal Reserve meeting — the expectation is that the central bank will raise interest rates, a move that will likely have negative repercussions for precious metals. All in all, those forecasts are fairly — and in some cases very — optimistic considering where the silver price is today. And in general it seems that silver-focused companies are feeling somewhat hopeful as well. Both CEOs also provided some sage advice for investors worried that 2016 will bring more pain for silver rather than the improvements many are calling for. “Be just a little more patient,” said Cooke. “After more than a four-year correction in precious metals and mining stock prices, long-term investors should be looking to add to their positions while gold and silver complete their bottom this year.” He noted that his company might be an option for investors looking to do just that. Certainly some food for thought as the silver market heads into 2016. Editorial Disclosure: American CuMo Mining is a client of the Investing News Network. This article is not paid-for content.